It is impossible for cats to balance properly, climb, and defend themselves properly without – guess what? – their claws. Cats’ claws are much more important to them than humans’ nails are to humans. The damage of not having claws is about the same for cats as it is for humans losing their toes. Therefore, it is important for people to understand the impairment of declawing – the procedure that removes not only the claws but also bones and cartilage that holds them in place. (1) There are many ways to avoid declawing and save cats from this quite stressful procedure. Many veterinarians themselves realize that the procedure is harmful to cats and refuse to perform it. They are conscious of the pain that cats may suffer from after the operation and do not consider the surgery acceptable for pets. Do cats really need claws? Yes, they do! As all animals, cats have instincts including clawing objects. By doing so, they play, keep the nails sharp and mark their territory. Cats even use their claws for stretching. During the times before domestication, cats developed an instinct to scratch the bark on trees. Now scratching different subjects and surfaces, even though can cause a lot of damage to one’s property if not trained, is vital for satisfying cats’ natural instincts; therefore, it keeps cats healthy both physically and mentally. Is declawing not a harmless procedure? Before declawing your cat, it is necessary to understand how it is done and what are the possible consequences of this procedure. Besides removing the nails, it also involves 10 amputations of the last joint of each toe with a scalpel or guillotine clipper with general anesthesia. Complications of the surgery include adverse reaction to anesthetic; gangrene, which can lead to limb amputation; hemorrhaging; permanent nerve damage; persistent pain; reluctance to walk; scar tissue formation; sequestrum (bone chips), requiring additional surgery; and skin disorders. Basically, this simple at first glance surgery can deprive a cat of the ability to freely move around. There is a risk that after declawing the nails may still grow but people will not see them because they will grow inside the paw instead of outside. In this case, a cat can suffer from great agony, while the reason of it will stay unnoticeable to others. Overall, declawing, in addition to weakening of limbs and back muscles, harms a cat’s balance in a way that interferes with their learned moving habits. In fact, cats have to learn walk, run, and jump all over again. 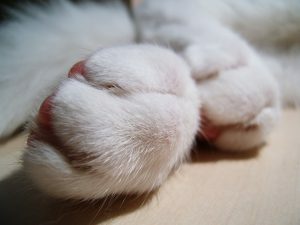 Because cats with amputated claws lose the ability to visually mark their territory, they may mark their territory in other, not so pleasant to their owners, ways outside the litterbox, even if they are well-trained. Declawed cats may be depressed, unsociable, and withdrawn or ill-tempered, aggressive, and impulsively unpredictable. It would be a huge mistake to think that it is safer for kids if they play with a declawed cat. Actually, without the ability to protect themselves with their claws, cats feel extremely insecure and consequently, they behave more belligerently and bite more often. One study published in the Journal of American Veterinary Medical Association (JAVMA) proved that approximately one-third of declawed cats developed at minimum one behavioral problems and 80 percent acquired one or more. In fact, declawed cats are seven times more likely to pee in inappropriate places. There is also a greater chance that cats will be surrendered to shelters if they are declawed. Clip the tips of the nails when the cat is comfortable and peaceful. 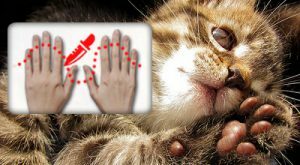 By trimming the nails regularly, you will do the same thing as cats do when their scratching subjects and eliminate the cat’s need to maintain the condition of its claws by yourself. It is the tip of the nail that ruins the furniture most mercilessly; therefore, by removing it, you make the life easier both for yourself and your lovely pet. Provide two or more scratching posts for your cat to meet its instinctive need by getting out his emotions on scratching what was made to be scratched. Now with so many resources and different choices both in markets and online stores, it is unproblematic to buy a long-lasting scratching post. As a piece of advice, soft and fluffy posts do not really work well, it is better to buy bark-covered logs that will satisfy cat’s needs to claw. Also, consider the cardboards or sisal “scratching boxes” that lie flat on the floor. They are small, compact, inexpensive, easy to move around the house. However, they do wear out quicker than the hard-covered scratching post and would need to be replaced fairly more often. Remember to check on the state of the scratching posts so that cats do not get aggravated and attract your attention by ruining your furnishings. Teach your cat some rules considering the places he is and is not allowed to claw. Put your cat on the new post and move its paws or pretend to be scratching the new post yourself. Make scratching fun, play with your cat on and around the post. You can make the scratching post even more fun if you tie some string to it and attach some toys to them. Cats are also more likely to use the scratching post if you place it near the places where they hang out the most, like their sleeping place or near their favorite furniture to scratch. If your cat continues to scratch the furnishing, do not hit him, simply say “no” firmly, relocate him to the appropriate scratching post and give him a treat for using it instead. The post will appear more attractive to the cat if covered with catnip. (2) Christianne Schelling, D.V.M., Declawing.com, last accessed 4 Aug. 2004. (3) Geoff Pingree and Lisa Abend, “Abandoned Pets Find Haven,” The Christian Science Monitor, 23 Jun. 2004. (4) Louinn Lota, “West Hollywood Becomes First in State to Ban Declawing,” Associated Press, 8 Apr. 2003.